Industrial technology product innovators, you can now rely on STMicroelectronics and Witekio’s partnership to speed up your IoT and industrial automation projects! STMicroelectronics builds on its expertise in ARM Cortex and launches STM32MP1, its first multicore microprocessor to continue the STM32 success story. As the Android 9.0 board bring-up partner to STMicroelectronics, Witekio is proud to bring our software expertise to speed up our customers’ product development journey. What features does STM32MP1 show that make a difference for your time to market? What are the benefits for innovators in industry? 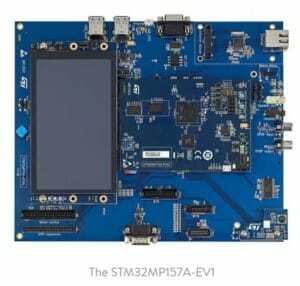 STM32MP1 is the first MPU launched by STMicroelectronics. It benefits from all the experience of the global semiconductor leader and from the success of the STM32 MCU product range. STM32MP1 is a general purpose MPU, suitable to all developer types and multiple applications, be it in the industrial field or for the health and wellness market or for home appliances and consumer goods. This new MPU brings an advanced and flexible architecture with 3D GPU for your HMI, power management capabilities, fast processing and real-time. It also embeds a large set of peripherals. STM32MP1 MPU design has been anticipated to allows innovators to speed up their industrial innovative projects making no compromise on product performance. You can take full advantage of a Linux development while making it simple as STM32MP1 embeds a fully mainlined open source Linux distribution. The MPU multicore architecture with compute and graphic support as well as high feature integration will allow you to build HMI and user experiences fitting with your highest customers’ expectations. STM32MP1’s architecture is ideal for real-time and power-constrained sub systems ensuring your device’s high performance. And you will benefit from all the STMicroelectronics services, including the 10-years longevity commitment. To get more details click here to read the STM32MP1 brochure. 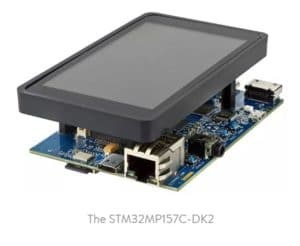 Given Witekio’s key involvement in bringing Android Pie to the STM32MP1, as STMicroelectronics partner, we welcome customers to come to us with any of their board and application related software challenges. Our goal is to help customers tackle complex inter-processor communication and deliver robust full-stack software services for a successful product launch . Through our development collaboration with STMicroelectronics, Witekio has gained a deep knowledge of the STM32MP1. Our expert engineers bring their knowledge and expertise to co-pilot your innovative project from a software perspective to conceive, develop and integrate your full software system and make sure your project is a success. 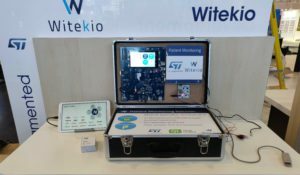 Witekio contributes to the launch of this new MPU, through its presence at STMicroelectronics’ booth at Embedded World. Our mission, as STMicroelectronics partner, is to show real-world applications and the benefits of the STM32MP1 in an innovative project. Our software engineers have built a demo to show what STMicroelectronics’ STM32MP1 can do in a realistic patient monitoring scenario. The patient monitoring demo shows a medical application with STM32MP1, running Android 9 Pie and Qt 5 application. The demo monitors pulse, temperature and electrocardiogram through sensors. Results are displayed in real-time on a HMI using Qt 5. Our expert engineers are on site during the show to answer all your questions, live. Witekio has 17 years of experience developing board support packages and low level software layers for the semiconductors and hardware industry. Our software engineers have become experts in developing and customizing software for many types of hardware platforms and microchips. As STMicroelectronics partner, Witekio’s team of software experts are highly motivated to help customers with their Android 9.0 porting or any other software development challenges for the STM32MP1. More news about this soon.